My previous post was born out of my frustration that some feel that there is a 'clash of cultures' that will inevitably lead to conflict between east and west/Islam and Christianity. My view is that within Europe, the Middle East or China there are tensions between liberalism and authoritarianism with any society being susceptible to becoming dominated by either strand. Every individual needs to decide whether to place there faith in authoritarianism or liberalism, a decision which will be dominated by their experience. I believe a person's attitude to uncertainty will be fundamental in determining their view towards liberalism or authoritarianism. Cheryl Misak explains the argument: if the future is unpredictable one must be liberal and open to any point of view, since a minority view might actually be the best. If the future is predictable then one should place faith in those most competent at predicting the future. Some ancient historians highlight how Mesopotamian society was founded on unpredictability while the opposite was true for Egypt, and this had profound effects on their cultures and religions. 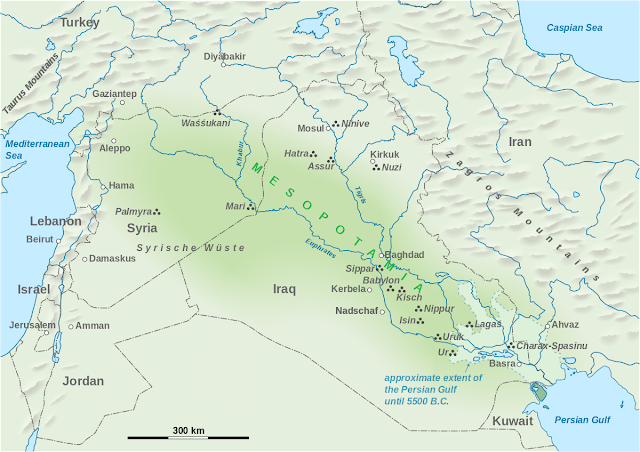 Mesopotamia is a flat flood plain surrounded on three sides by mountains and to the south by desert. The region, as an alluvial flood plain, was extremely fertile. However it was susceptible to devastating floods, which tended to come at the end of the crop growing season, that could destroy communities. 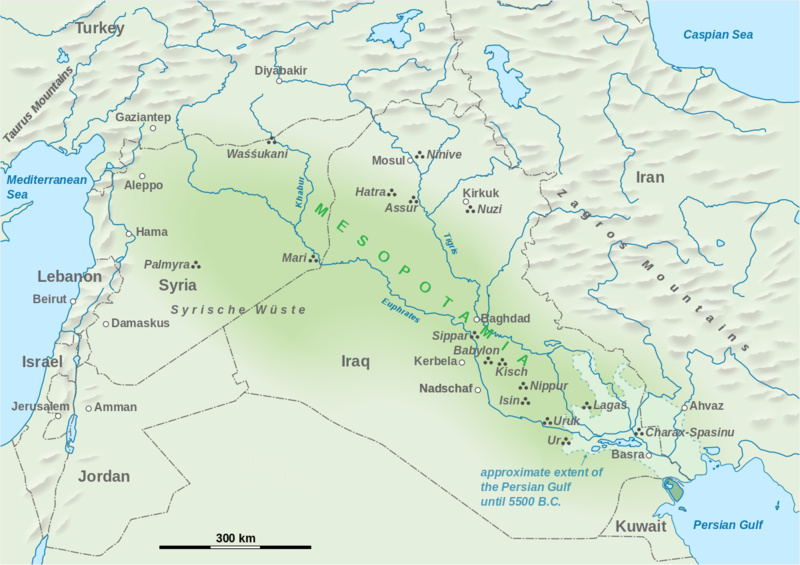 The Mesopotamian civilisations were also vulnerable to invasions from mountain tribes, such as the Hittites from Anatolia to the north or Medes from the Zagros to the east. As a result Mesopotamian religion sought to understand capricious gods and learn to predict their behaviour. This motivated the development of astronomy supported by mathematics. The difference between Egyptian and Mesopotamian approaches are highlighted in their different conceptions of the afterlife. Egyptians believed that if individuals had lead a moral life such that they could pass the judgement of the gods, then their soul would enter paradise on death. Because the natural world followed stable, predictable patterns, there were regular laws of nature and it followed that there were clearly defined laws of morality, which must be observed. The Mesopotamian afterlife was a dark, desert-like underworld devoid of water or food; the dead ate dust. Everyone ended up in this heel, whether they had been good or bad, reflecting the capriciousness of life. Essentially, the Egyptian conception was based on justice: if a person leads a moral life they will be rewarded. The Mesopotamians, on the other hand, did not assume an individual gets their just deserts. I feel that much of the discussion around 'economic justice' presupposes that the world is governed by stable laws that represent an ideal (traditionally, the divine) and this means that choices can be judged as either good or bad. I am not convinced such stable laws exist in societies and so clear cut judgements are difficult to arrive at. I started thinking about these ideas after I spoke at the Edinburgh Science Festival and an audience member was angered by my lack of attention to the problem of wealth inequality. They asserted that money should be distributed "democratically" and seemed to be under the impression that, as a mathematician, I claimed to have deduced a way of "fairly" distributing wealth. As someone who is extremely sceptical that economics follows any identifiable patterns, just as the Mesopotamians seem to have rejected the idea that there are stable laws of nature, this has never been my objective. What I am interested in is what is the role of mathematics in finance. My conclusion is that financial markets are arenas in which parties work towards coming to agreement. This means that to work well they must be governed by discursive rules, rather than traditional norms about what is "good" or "evil". I adopt Habermas and argue that statements in finance, prices quoted, must be true, truthful and right. They must conform to objective, subjective and social truth criteria. To this end I argue that reciprocity determines the objective truth of a price and is linked to mathematics, while sincerity addresses the subjective truth and charity delivers social rightness. Together these norms lay the foundations for trust in finance. I really enjoyed reading your post here and how you tie together many seemingly unrelated topics. They really do fit together when you reflect upon it. Have you written other posts where you perform such an analysis on modern day societies?